Always on the look out for USA made options, I found another great option for bandages. 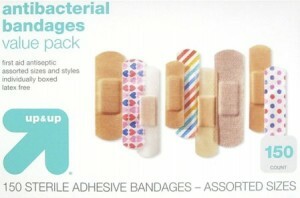 If you don’t mind store brand products, Target offer varieties of USA made bandages. I have not personally used these bandages but I know their Up & Up cotton rounds (also made in USA) has great quality and sensible price. For people who don’t want to go with store brand, Nexcare bandages are made in USA. Since my first post about Nexcare, I have been tracking the Nexcare bandages in case they lost their way and go offshore. As far as I can see from the products on the store shelves, they are still made in USA. To save yourself some money, make sure you check for 3M coupons before going to the stores. This entry was posted in I Found This, Made in USA, Tips for Daily Life and tagged made in USA, nexcare bandage, up and up bandage by n2n. Bookmark the permalink.